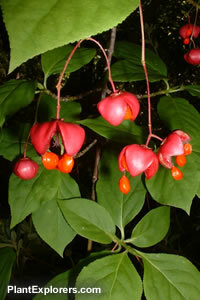 This large shrub, or small tree, has larger leaves than the closely related <i><b>Euonymus alatus</i></b>, smaller corky wings on the branches, and can produce one of the most unusual colour palettes in the autumn, with a mix of green, red and even white leaves. The unusual compound fruit are produced in late summer and persist into the early autumn. Height and spread is 10 feet. A remarkable tree worthy of attention. Stronger autumn colour is produced on neutral to alkaline soils, while the almost white colouration is produced on acid west-coast soils. Sow seed in containers in autumn to spring in a coldframe. If planting in the mid to late spring, stratify the peeled seed by refrigerating the pots for 4-6 weeks. Grow in any well-drained soil in full sun to light shade. In full sun, needs moister soil. For maximum freshness, please keep the seed refrigerated in its original packaging until it is time to plant.